Use home automation to get your hot water fast , save thousands of gallons of water, and turn your plumbing system green with X10 control modules. Home automation project adds convenience, water conservation, and saves you time! Over a million gallons of water are run down the drain each day in just the existing single family homes in the United States while waiting for hot water. The energy consumed to pump and treat the water and resulting sewage creates green house gasses when it’s generated. The Chilipepper demand pump completely eliminates this waste. No more water down the drain! The Chilipepper needs a momentary contact on its control wires to activate. Once activated it turns itself off when the hot water arrives. Once the pump shuts off you have instant hot water when you turn on the tap. An X10 UM506 remote receiver can be used to provide the momentary contact. 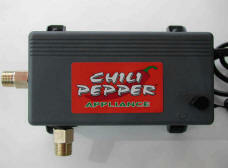 The Chilipepper appliance is inexpensive and easy to install! All plumbing connections are made with hoses. Use home automation (X10.com)control your hot water system. Saves you thousands of gallons of water per year! Full 30 day money back guarantee! Consumes less than $2.00 worth of electricity per year to operate. The Chilipepper works with any kind of water heater including tankless water heaters. The Chilipepper is a small, powerful, micro-processor controlled pump that mounts under your sink It pumps the hot water from your water heater through your hot water pipe and returns the cold water that was in the hot water piping through the cold water pipe back to the water heater. No water gets run down the drain. When hot water reaches the pump, the pump automatically shuts off. When you hear the pump shut off your hot water is waiting for you instead of you waiting for it! In many cases your house plumbing system allows you to provide quick hot water to several, or even all of the sinks and other fixtures in your home with just one Chilipepper. After you install your Chilipepper you will feel good whenever you use your hot water. You are saving water and helping preserve the environment. By reducing your water consumption you reduce the energy required to pump and treat the water and thus reduce greenhouse gasses released into the atmosphere while generating that energy. In many areas sewage costs are based on your water consumption, therefore by saving water you spend less on your sewer bill. If you have a septic system, a Chilipepper will reduce the sewage flowing into the system increasing its life. The Chilipepper comes complete with a push-button. Or if you prefer, wireless operation from any room is easy with the wireless remote option. You don’t have to stand around waiting for the hot water any more! Start saving time, water, energy, and money… get a Chilipepper today, and get your home automation project underway!